Scorpio is a complex sign, people of which have a strong character. The boy has a whole set of unique qualities: courage, determination, responsiveness, truthfulness. He knows his own worth, always with dignity. In the choice of friends, he shows selectivity and caution, he prefers to maintain relations only with reliable people. The boy Scorpio possesses irrepressible energy, he fearlessly undertakes any business. He tries not to show his doubts, he prefers to look like a confident person. Touchingly protects close people, for his family he is a support and a defender. In case of danger, it becomes angry and aggressive, Scorpio is a serious opponent, merciless towards his enemies. Scorpio is a water sign, the dominant element influences the character of its representative. The boy has a strong intuition, he easily guesses the thoughts of the surrounding people. The guy is too focused on himself, thinks and imagines a lot. He can not be reproached for his poor upbringing, if necessary he can support the conversation. In the conversation he behaves politely, but a little suspended, except for old, time-tested friends. Scorpio boy rarely shares his thoughts. Natural restraint and secrecy can lead to negative consequences: unmotivated aggression and outbursts of rage due to internal tension. Scorpio differs sharp mind, he likes to read, and even more — to watch. The only representative of the water signs has a business acumen, can organize a successful business. Recommended fields of activity: trade, finance, construction. Scorpio has a real masculine quality — honesty. He is so well versed in people that he can easily guess their secret thoughts. From it can turn out a subtle intriguer, achieving his goals by cunning and deceit. But the most important quality for Scorpio — decency. He will not bring joy to success, which he does not deserve. The boy avoids ambiguous situations, always clearly expresses his opinion and does not doubt his choice. Too unyielding, incorruptible person irritates dishonest people. 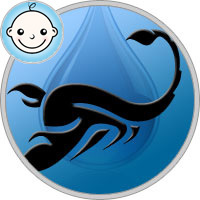 Scorpio is an active, energetic person, despite his belonging to the element of Water. He hides his indecision deeply in the soul, surrounding people demonstrates the strengths of the character: purposefulness, perseverance. He always follows the path clearly, is quite persistent in achieving his goals. The boy will work hard, forgetting about rest and sleep, but will enter the best educational institution. He is too demanding not only to himself, but to a close environment. Scorpio should be more sincere and sympathetic to people, not all of them have a strong character. From the early childhood the boy has a fearless disposition. He is capable of decisive action, despite internal fears and fears. It is quite worthy of perceiving defeat, although it painfully worries him. The brave boy is not afraid of injuries and bruises, he is ready for many sacrifices. Thanks to a strong intuition, he safely avoids dangers, so it may seem to others that success to Scorpio is easy. At the same time, there are few who are able to act fearlessly and decisively. Scorpio has a hot temper, although he tries to restrain his emotions. He is very quick-tempered, intolerant of other people’s weaknesses. He can be too categorical in judgments, it can hurt people around. At the same time he does not take criticism. A man who dared to disrespect the Scorpion, acquires an enemy for life. Even over time, the boy will not forget the offense, find a way to get revenge. The observant guy subtly observes people’s weaknesses, knows how to use them for their own purposes. He is very cruel and vindictive even in relation to family and friends. Baby Scorpio behaves quite calmly. He has curiosity and imagination, so he will always find something to do. The boy easily gets acquainted on the playground, but that does not mean that he takes his friends seriously. It is important for him to study a person from all sides before he begins to trust him. The active kid often gets injured, even more often tears and dirty clothes. Parents should not scold him, the boy seeks to explore the world around him. In school years, Scorpio is quite successfully studying, his energy is enough for public activities. He is equally good at all subjects, especially he is given the exact sciences. An energetic boy enjoys sports, he likes to win competitions. Young people need moderate physical activity, parents should pay close attention to his health. A guy often gets cold, so he spends his time at home, his weak spots: lungs, throat, kidneys. Sometimes Scorpio is too cruel to weak children, parents should teach the boy compassion. Otherwise, school years are a happy time for Scorpio. In adolescence, a quick-tempered youth is capable of a serious riot. He painfully perceives any interference in private life. A temperamental guy falls in love very often, parents should not criticize his chosen one. He is so confident in his choice that any innocent comment takes too much to heart. Scorpio in protest can leave the house, parents will have to make significant efforts to restore the trust of his son. Education of Scorpio requires utmost honesty. A boy so thinly feels a lie that it easily recognizes deception. A vulnerable guy may stop trusting his parents, it will be very difficult to regain his position again. Scorpio is too harsh in their actions and statements — this is the property of his nature. Such a manifestation of negative character traits can not be ignored. Adults should gently guide their son, violence and severity in education will lead to retaliatory aggression.